The latest version of SubscriptionBoss, 1.32, has some new features, enhancements and bug fixes. The highlight is support for the new shopping cart themes; however it also has benefits for those shipping physical products. With SubscriptionBoss, you can add line of script to your Infusionsoft cart theme so it can handle payments using PayPal for purchases made through Product Bundle links. It is limited to processing a single product and/or a single subscription at the same time. When you have the product bundle links you can put them on your sales page or in sales emails or wherever you want to make a sale. I personally am using them in my WP Whoosh plugin which sells and installs our premium mobile responsive Genesis themes. With this feature I no longer need to create a new order form for every theme. I can essentially use the same product bundle link and just change the Product ID parameter. For example, the link https://purpleparasol.infusionsoft.com/app/manageCart/processBundle?clearCart=true&executionMode=PRODUCT_TARGETED&checkoutMethod=singleStep&productId=165&productQuantity=1&styleThemeId=81 takes the buyer to the checkout for the Michele theme. Navigate to Infusionsoft E-commerce Product Bundle Links, then select the product or subscription and click on the Add To Bundle button. Select Single Step checkout type and your preferred Cart theme. Then check both checkboxes to ensure the order is exactly what you specified in the product bundle link. [x] Remove all other products and subscriptions from the cart when this link is clicked. Then click copy to grab your link, and then use the link on your sales page or in your sales letter. 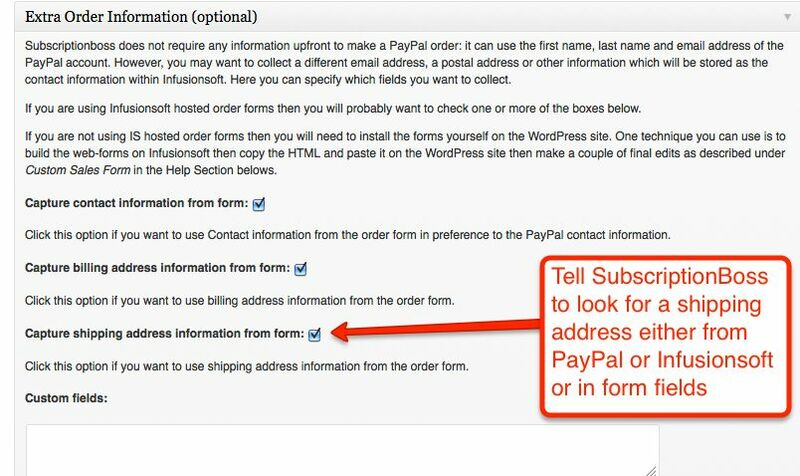 All you need to do in SubscriptionBoss is go to the Extra Order Information section and click the checkbox Capture shipping address information from form and in the Order Confirmation section decide your PayPal Shipping Address selection as to whether or not the user is allowed to change their shipping address. The changes in the previous release had some benefits, but also had some problems: they failed to cater for handling payments for subscriptions which had since been deleted or renamed in SubscriptionBoss. When SubscriptionBoss could not find a matching subscription it did not process the payment. This logic has changed in this release so the payment gets processed first before any matching of subscription takes place. Is this IPN refer to a payment, refund, payment failure or cancellation?